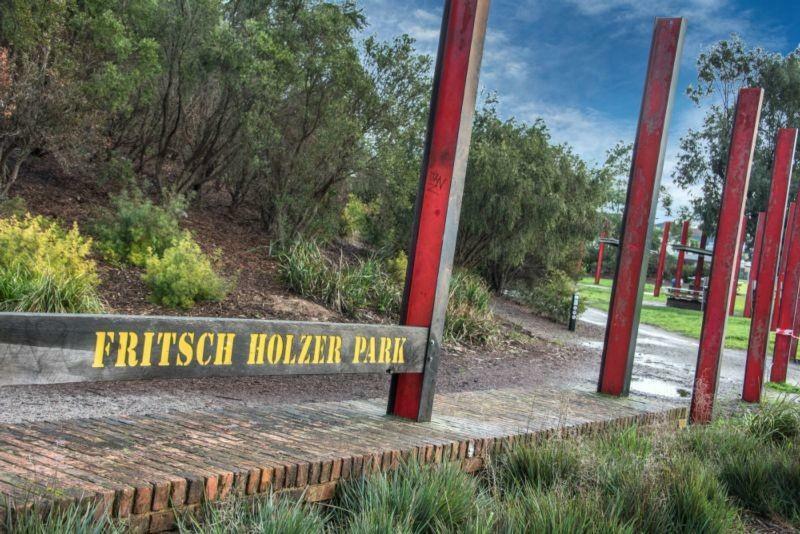 The Fritsch Holzer Park Project was a joint venture project based on the Commonwealth Government New Work Opportunities program, between Rotary Hawthorn, DEET (Federal Government Department of Education, Employment & Training) and the new City of Boroondara that had just been created by the amalgamation of Hawthorn, Kew and Camberwell. Rotary Hawthorn applied to DEET to undertake this project in February 1995, and after proceeding through the primary and secondary phases of the application process, funds were awarded to Rotary Hawthorn in May 1995. The project site was the old Hawthorn municipal tip, re-zoned as public open space, then filled and sealed in a landform ready for landscaping and development as parkland. A joint venture between Council and Melbourne Water was also to utilize the area as a retarding basin to minimise flooding to downstream private property. The park had to be a staged development due to funding limitations, and local residents were consulted to determine priorities. • Public lighting and irrigation systems. The landscaping, planting, pathways, fun and fitness track, and irrigation were included in the first phase of the project to be completed under the Rotary Hawthorn/DEET scheme. Other items were to be future stages. Charles Morrison first identified the community value of this project and had committed $45,000 towards the pathways (fun and fitness tracks) when he was club President. Project management as "services in kind" was provided by Ian Warren (Warren & Rowe) and recognised as an added contribution attracting subsidy by DEET and added to the Rotary Club of Hawthorn contribution. The Club funding application to DEET raised a further $141,740 towards the project, conditional upon the club providing work training for 12 long-term (4 year plus) unemployed project for 6 months under the 'Working Nation" New Work Opportunities program. The funding application was made with the support of the City of Boroondara. When that was successful, Ian Warren met with the City's then Chief Commissioner and convinced him to commit a further $165,000 towards the project. That Council commitment provided full-time site supervision and other resources and materials for the works within their contribution limit. So, the $45,000 Rotary Club of Hawthorn contribution resulted in a $350,000 community project, a funding leverage of almost 8 times the basic Rotary contribution - and all achieved through the initiative and management of Rotary Hawthorn! Because of the club’s role initiating this project, Ian Warren was also invited to represent Rotary on a special community committee whose charter is to oversee the development of the park. Through that committee, Rotary Hawthorn was publicly acknowledged as being responsible for mobilising this project and creating the financial capacity and management arrangements, and which would not have proceeded for some years had it not been for the Club's involvement. The project was to engage 12 long term unemployed on the project for 6 months and provide both work and skills training during that time. In June 1995 a number of potential participants were interviewed by the Club, and on 30 June the 12 selected candidates commenced work. Unfortunately, one participant dropped out in the first week, and a second had his engagement terminated after only a few weeks. The remaining 10 participants continued as a close-knit, productive team, and all 10 continued until the project completion at Christmas 1995. The social interaction and skills of the participants were carefully monitored, and the benefits to them were clearly evident. Some were natural leaders, and could be left in charge of the group, others were hard physical workers, and others performed particularly well in their training course assessments. Two had fairly serious literacy problems. Federal funding conditions required that participants receive formal training for at least 25% of the time. To this end Ian Warren negotiated with Burnley Horticultural College in nearby Richmond to provide an appropriate formal training program. This course was formally structured and provided credits to participants to further their studies through a TAFE Certificate of Studies in Horticulture. The course content included units such as Introduction to Horticulture, Landscape Construction, Garden Management, Plant Identification and Use, all with excursions to nurseries and other parks and gardens. Some units included assessment programs, although there was no pressure for participants to "pass an exam". Rotary Hawthorn also provided other vocational training, including job interview skills, preparation of personal resumes, and motivational programs. Council also provided on-site training in subjects such as machinery operation, and occupational health and safety. The first phase of the Fritsch Holzer Park project was completed at Christmas, 1995. In the latter weeks of the program, Rotary Hawthorn presented a series of on-site talks to participants to provide direction and incentive for their impending return to the workforce. Club President Noel McInnes gave a motivational address, and a representative of the Camberwell Job Club presented with advice and hints on job seeking, interview techniques, and so on. All participants were provided with a "job seekers kit” with an individual reference from the City of Boroondara and Warren & Rowe (as project managers), and a personal curriculum vitae. The success of this project was not only measured by the completion of new urban infrastructure. More importantly, it was measured in the context of 10 people who had a new purpose in life, a reason to get out of bed in the morning, a rekindling of their dignity and self-esteem, and a new sense of financial self-sufficiency and independence.